Excise and Taxation Department officials said that four Ludhiana-based steel traders were found involved in a scam where steel worth Rs 600 crore was transported on two-wheelers within and outside Punjab. In the process, the department suffered a loss of Rs 35 crore through tax evasion. Tension prevailed on the Punjab Agricultural University campus when a group of students from Hostel Number -1 challenged the newly reconstituted body of the Punjab Agricultural University Students Association (PAUSA) by pasting posters of their own "president". PAUSA was reconstituted this morning, after Sahranbir Singh resigned from the post of president. Karanvir Singh Sandhu has been elected as the new president. 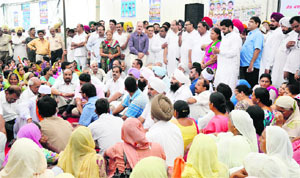 Agents had a field day as a large number of residents thronged the Ludhiana Municipal Corporation offices to get their properties regularised. As there was huge rush at the MC offices, the “agents” were seen charging anything between Rs 500 and Rs 1,000 per file from the residents. Following a slump in the dairy farming sector, the business of selling milk by small-scale milk sellers has been mushrooming unchecked in the Jagraon area. 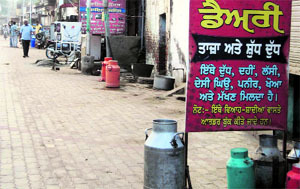 During a random survey conducted by The Tribune in Jagraon, as many as 150 milk vendors were seen selling milk in 50-100 liter containers at a distance of every 40-50 meters. Some of them were found to be selling milk under highly unhygienic surroundings. Hike in the processing fee and division into different categories has irked the traders. Processing fee on zero per cent VAT has further made the scenario worse for them. Trade bodies have decided to submit representations to the government urging them to roll back the hike in fee. 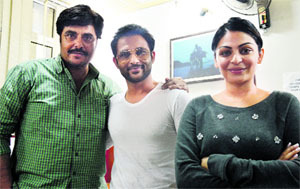 Star cast of Ronde Sare Viah Pichhon (RSVP), actors Neeru Bajwa, Harish Verma and Guggu Gill, were in the city for the promotion of their upcoming Punjabi movie. The movie sends across a message that marriage should not be done promiscuously and partners should be carefully chosen. 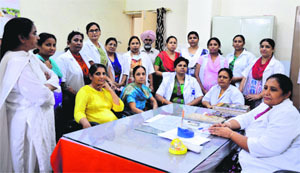 Accusing the Punjab Government of meting out step motherly treatment to them, the health staff working under the National Rural Health Mission today went on a two-day strike. "Although the number of books being published in Punjabi has been increasing, the number of literature enthusiasts has declined sharply,” said Manjit Singh Rajpura, editor of a newly released children’s magazine, "Kikli". Ludhiana is one of the biggest district in Punjab, which perhaps has the maximum number of government schools; yet no teacher from the district was able to get a state award at a function held recently. As many as six persons were injured after a bus collided with a truck in the Dhandari area here this evening. The bus was ferrying factory workers back home after work when the incident took place. October is internationally observed as the Breast Cancer Awareness month. To spread awareness among the public, eminent breast cancer specialist Dr Navdeep Singh conducted a session at Women ITI College. The nursing staff union of the Lord Mahavir Civil Hospital has accused the authorities of making the three nurses and a Class IV employee scapegoats in the alleged child swapping case. While denying that any child was swapped, the investigating team of doctors had found the three staff nurses--Neelam, Bhupinder and Palwinder Kaur--guilty of committing a clerical error of filing the newborn girl’s gender as male in the delivery register. As many as 22 more cases of dengue have been reported from various hospitals of the city, taking the total number of cases to 358. Of these, eight patients are from the Ludhiana district, 11 from other districts of the state and three from outside the state. Perturbed by the lackadaisical attitude adopted by the Pepsu Road Transport Corporation (PRTC) in disbursing their pensions, the retired employees today took out a protest rally against the corporation near Dhayan Singh Complex. Death of two tigresses in the past two days at a tiger safari near Amaltas has sent the alarm bells ringing for the wildlife department. 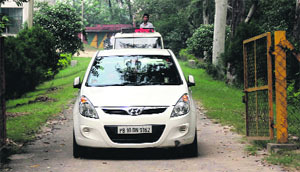 Dr Kirti Dua, head of wildlife centre at Guru Angad Dev Veterinary and Animal Sciences University, has recommended a blood test of the zoo animals to ascertain if the tigresses died due to any infection. 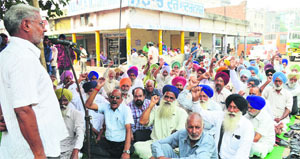 The Communist Party of Indian, Communist Party of India (Marxists) and the People Party of Punjab, after a joint meeting today, expressed their “strong opposition” to the financial burden being put on the common man by the Punjab government through the imposition of property tax and regularisation of unlicensed colonies. 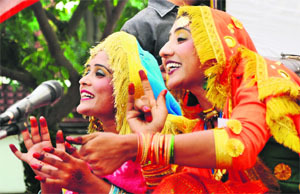 Ludhiana: Maya Devi Goel Public School, Pohir, and Doraha Public School, scripted victory in Sahodya School’s solo singing competition at Pohir village. Concluding session of the event was presided over by Sukhjinder Singh Behal and Bajrang Sharma was invited over as the chief guest. 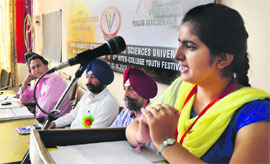 Ludhiana: Guru Angad Dev Veterinary and Animal Sciences University, Ludhiana, conducted debate, elocution, extempore, creative writing, poetry recitation and satiric pieces of Haas-Ras poetry on Monday. Dr Darshan Singh Barhi, organising secretary of festival, said students expressed their thoughts through poetry on current and important issues. A domestic help decamped with gold ornaments and cash from his employer’s house located at Brindawan Road in the Civil Lines area today. The incident came to light when Yashpal Singla, returned home along with his family members from a restaurant. He was shocked to find his house ransacked. Domestic help Sushil, a native of Nepal, was also missing. Additional Sessions Judge Priya Sood today adjourned the hearing in DSP Balraj Gill and Monica Kapila murder case till October 15. The court today recorded the statement of Dr Raj Kaura, who had conducted the postmortem of Monica Kapilla. The cross-examination of prime prosecution witness Jaspal Singh was also concluded by the defence lawyer. Arguments on bail application filed by accused Davinder Pal Singh will be heard in the next hearing. Ludhiana will host the state-level Swami Vivekananda sports festival from October 18 to 20. Additional Deputy Commissioner Neeru Katyal said around 2,500 sportspersons from all over Punjab were expected to take part in the event to be held at Guru Nanak Stadium. Fine batting by Arjun (60) and an equally valuable contribution with the ball by Ravjot Singh (4 for 22) held hosts MGN Public School to script an easy 51-run win over Kundan Vidya Mandir, Civil Lines, Ludhiana, in the final of the 14th All -India Bhai Gobind Singh Pasricha Prize Money Cricket Tournament (U-19) held at MGN Public School ground, Adarsh Nagar, Jalandhar, today.